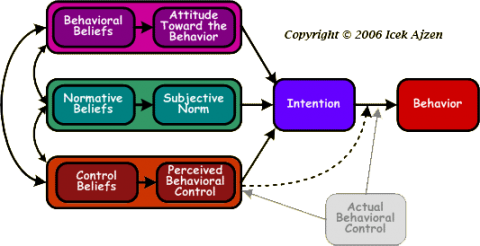 Theory of Planned Behavior (TPB) is a theory which looks at how behaviors are changed through influencing intention. It was created by Icek Ajzen is the same of Theory of Reasoned Action (TRA), except it adds a third element: perceived behavioral control (PBC). Perceived behavioral control is one’s perception of how difficult it will be to perform the behavior. If you are not familiar with the formula below, please refer to the TRA model before beginning to understand this one. PBC is also broken down into two factors: 1) the individual control belief (ci), which is the “perceived likelihood or frequency that the control factor will occur,” and 2) the “perceived facilitating or inhibiting power of the individual control factor,” represented by pi.